Pan di ramerino (literally "rosemary bread") are Tuscan sweet buns made with bread dough, olive oil, raisins, and rosemary. 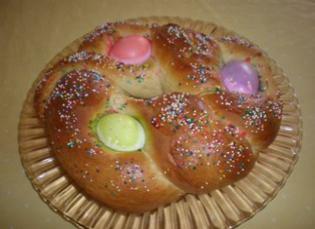 Very similar to hot-cross buns, they are traditionally eaten on Giovedi’ Santo, Maundy or Holy Thursday (the day before Good Friday). They are sold in bakeries and by street vendors outside the churches (often blessed by the priest). At one time, pan di ramerino was prepared only during Lent and precisely on Holy Thursday but now you can find in them in Florentine bakeries all year long - round and shiny with a split, criss-cross design on top. 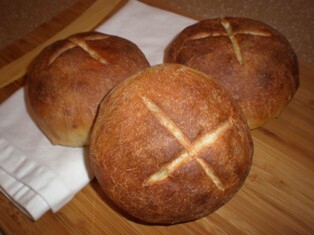 Some include a brushing of light sugar syrup on the top of the buns when they come out of the oven. In the past, pan di ramerino was often a large loaf - today it is commonly shaped like smaller round buns. Pan di ramerino is a nice bread to serve with butter or cheese, or as an afternoon snack with coffee or sweet wine. It is made with a starter, a mixture of yeast, flour and water which gives the bread more flavor but also requires that you make the starter a day before you plan on baking the bread. This dough may also be made into 2 loaves rather than 12 rolls. Bake the loaves at 400 degrees F. for 25 to 30 minutes. In a small bowl, combine the yeast and warm water; let sit until creamy, about 5 minutes. Put the flour in another bowl. Stir in the yeast mixture. Cover with plastic wrap and leave at room temperature overnight or up to 24 hours. The mixture will become thick and bubbly. 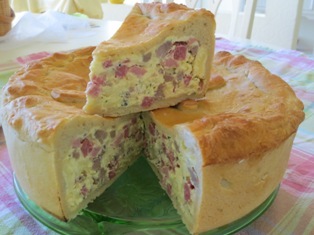 After 24 hours, you can refrigerate the starter for up to 3 days. In a large bowl, combine 3 cups of flour, the sugar, salt and rosemary. Add the starter to the bowl along with the olive oil. Stir until a dough forms. Transfer the dough to a lightly floured surface. Knead until smooth and elastic, about 10 minutes. Knead in the raisins. Lightly oil a large bowl. Place the dough in the bowl, turning once to coat both sides with the oil. Cover with plastic wrap or a clean kitchen towel and place in a warm, draft-free place for 1-1/2 hours, or until double in volume. Line a large baking sheet with parchment paper. Transfer the dough to a lightly floured surface and divide into 12 equal-size pieces. Roll each piece into a ball. Place the dough balls on the prepared baking sheet, allowing space between them for the dough to expand. Cover with plastic wrap or a clean kitchen towel and let rise for 45 minutes to an hour, or until doubled. With a sharp knife, cut a cross-hatch pattern ( like a tic-tac-toe design) on top of each dough ball. Brush each ball generously with the egg wash. Bake for 20 minutes or until the rolls are golden brown. Transfer the rolls to a wire rack to cool completely.